There are many ways to encourage people. 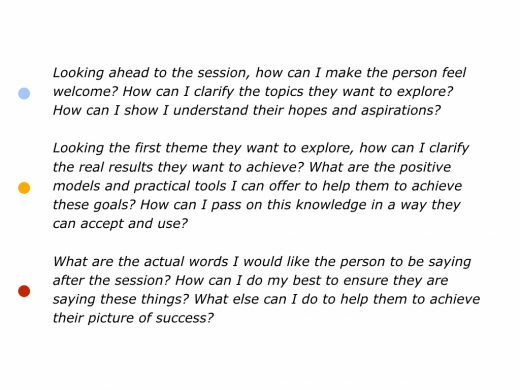 One approach is to create a positive environment in which people feel able to explore their aims. 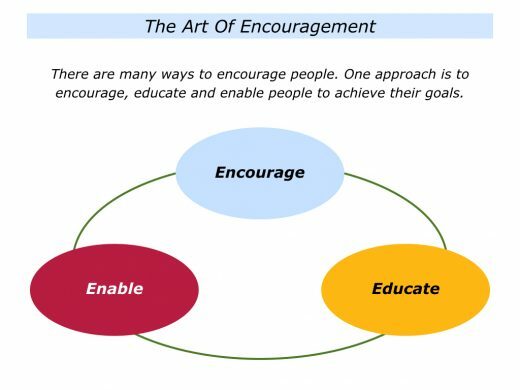 It is then to encourage, educate and enable people to achieve their goals. Different people follow this approach in different roles. They may do so when acting as a parent, teacher, nurse, therapist, coach, mentor, leader or in some other role. They may do so by listening, supporting or passing on knowledge. Whatever route they take, they sometimes go beyond providing encouragement. They offer education – in its widest – that helps people to shape their future lives. 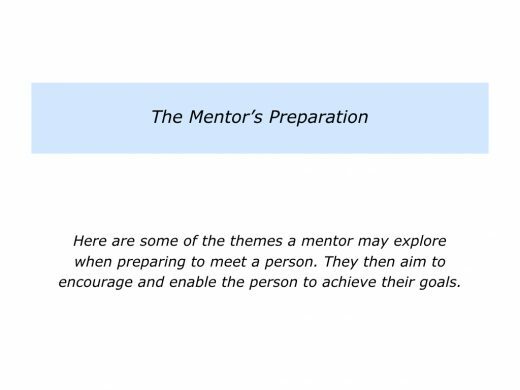 They also provide practical tools that people can use to achieve their goals. The encouragement approach had a strong influence on my own career. During the 1960s I was given the opportunity to work in therapeutic communities. At the time I had little formal training, so it chose to focus on what worked. Bearing this in mind, I approached many different people to learn about development. What has helped you to grow most in your life? Different people answered the question in different ways, but several key themes emerged. They said some of the following things. I had somebody who encouraged me. They made me feel as if I was the centre of their world. They encouraged me to build on my strengths. They also offered positive suggestions about how to deal with my weaknesses. These people were supportive, but sometimes they were tough. They encouraged me to take responsibility for shaping my future life. Looking back on your own life, can you think of a person who encouraged you? This may have been a parent, teacher, coach, manager or another person. What did they do to encourage you? They may have made you feel welcome, listened and provided words of support. They may have offered practical suggestions or opened doors to new possibilities. If you wish, try tackling the exercise on this theme this. This invites you to do the following things. 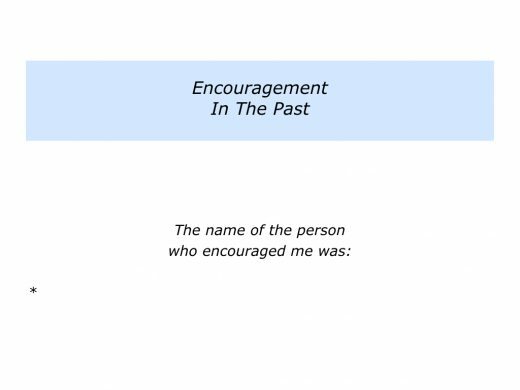 Describe a person who encouraged you in the past. 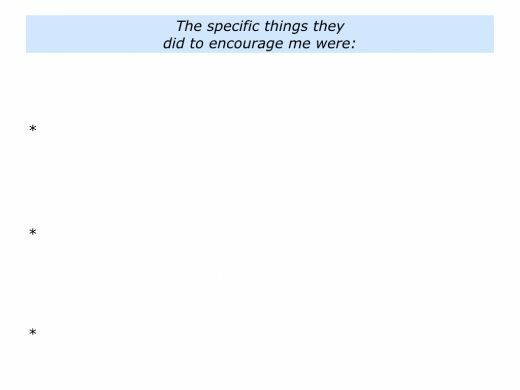 Describe the specific things they did to encourage you. Describe the specific things that happened as a result of them encouraging you. There are many ways to support people. This can involve personal, practical or professional encouragement. Let’s explore each of these themes. Sometimes this can simply involve giving people the love and support they need to develop. One person I know expressed this in the following way. My parents always encouraged me. Even when I was in a wheelchair for a year, they focused on what I could do, rather than what I couldn’t do. When I began walking again, it was hard for me to do sports. So my parents spent time and money on us learning to sail together. This helped me to grow in confidence. Now I use my skills to create opportunities for others. Sometimes this involves providing people with the basic materials for life. This means making sure they have food, shelter, healthcare and the practical things required to live fulfilling lives. Sometimes it also means offering them the opportunity to learn skills they can use to shape their futures. This was the approach taken by two colleagues I have worked with since the 1970s. Barrie Hopson and Mike Scally continue to have a clear mission. They help people to become architects of their own lives. They have expressed this in different ways over the years. They helped to pioneer the teaching of lifeskills in schools, colleges and universities. They then helped people in organisations to shape satisfying careers. During the past decade they have encouraged people to live enriching lives during their Third Age. Barrie and Mike have produced more than theories. They have passed on many practical tools that people can use in their daily lives and work. Here are some of their many books. Sometimes this involves helping people to find or do satisfying work. One company I worked with did this by providing their people with the opportunity of an annual Career Check. Every year they were invited to attend a Career Check workshop in which they focused on their strengths and the possible roads they could take in the future. The roads they could take included the following. To continue in their present role and keep doing satisfying work. To move to another role in the company. To create a new role in the company that would be a win for the person and a win for the company. To move on from the company – this was quite okay and the company would help them to plan the next step in their career. Most people stayed in the company after the workshop. They said that few work places would give them the opportunity to either grow in their present role or find a new role in the company. Some people left, but that was natural. Many of them reported that it was helpful to have honest conversations with their employer. They could then move on a good way. Some people transformed their careers. Jacqui Smith was such a person. During the workshop she found that a recurring theme in her life was creating enriching environments. She decided to pool her talents with David, her husband, a master carpenter. 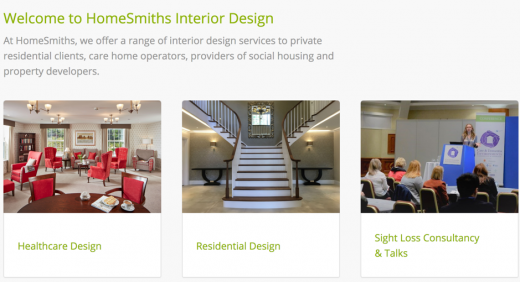 They set up their own interior design company called HomeSmiths. Beginning by working for family and friends, Jacqui and David found customers through their network. Sixteen years later they continue to do satisfying work and have gained national recognition. You can discover more about HomeSmiths via the follow link. Good encouragers often follow the path taken by good educators. Such people follow the old maxim that: ‘The learner learns what the learner wants to learn’. Bearing this in mind, they clarify the person’s agenda and aims. 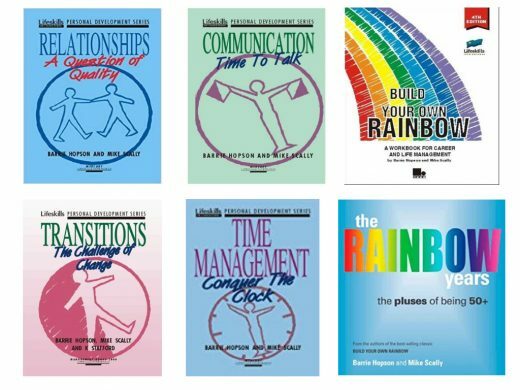 They then provide knowledge and practical tools that the person can use to reach their goals. Such educators believe that education is the ultimate democratic activity. Why? Because it enables people to have more options – and hence more freedom – to shape their future lives. Rick Snyder was somebody who did pioneering work in helping people to expand their options. 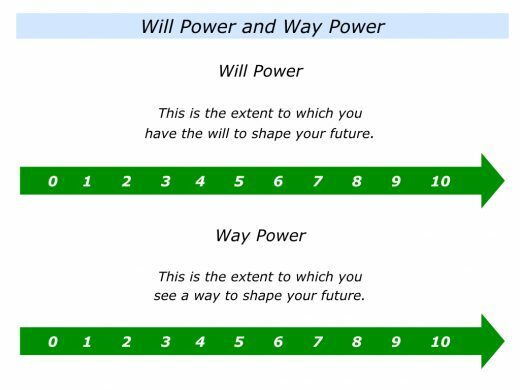 Writing in The Psychology Of Hope, he explained how it was possible to help people increase both their way power and will power. Let’s explore what this means. Encouragers sometimes offer people more options. This increases their way power and the ability to shape their futures. 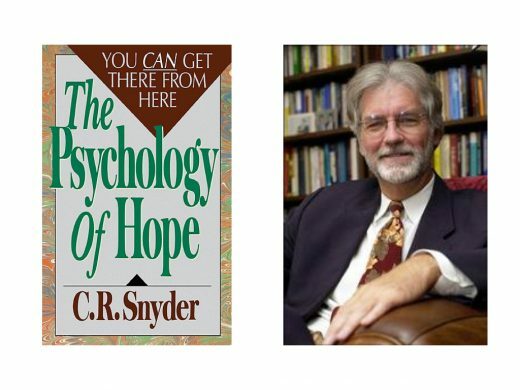 You can read more about Rick Snyder’s work on hope via the following link. Good encouragers aim to enable people to achieve ongoing success. Different people do this in different ways. One approach that is being used in some schools, for example, is to help students to become more self-managing. 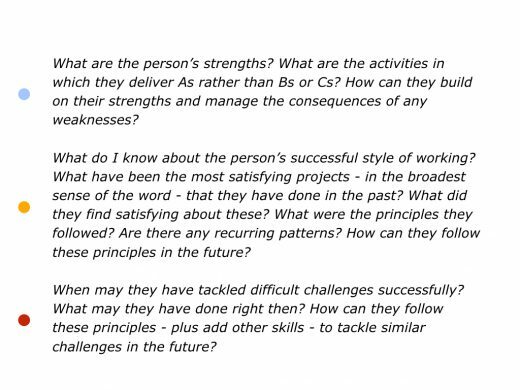 In the USA this often involves helping them to develop the Four Cs of the 21st Century Skills. These are Critical Thinking, Creativity, Collaboration and Communication. Here is a video that shows how this approach can work in education. You can discover more via the following link. Good encouragers are sometimes like good educators. Bearing in mind the person’s agenda, they pass on knowledge that is personal, practical and profitable. Practical – It must be practical and provide tools that help the person to reach their goals. Profitable – It must be, in the widest sense, profitable and help the person to achieve their goals. Different people practise this approach in different ways. They often aim, however: a) To understand the learner’s world; b) To understand the learner’s challenges and aims; b) To pass on knowledge and practical tools in a way that enables the learner to achieve their aims. 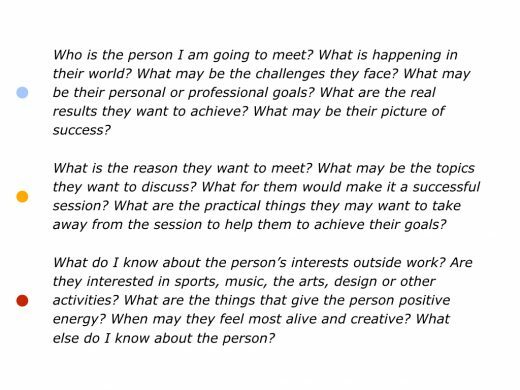 Good mentors, for example, often ask themselves some of the following questions before meeting a person. You would, of course, apply these ideas in your own way. Good encouragers are like good gardeners. They create an environment that enables people to grow. They do this when acting as parents, teachers, coaches, leaders or in another role. Encouragers also act as custodians of a culture. They do this when leading a project, school, team or organisation. Good leaders, for example, start by explaining the culture to people before they join. They outline the following themes. The organisation’s goals and the benefits – to all the stakeholders – of achieving these goals. The guidelines that people are encouraged to follow – the overall Dos and Don’ts – to achieve the goals. The reasons for following these guidelines to achieve the goals. The person is then invited to take time to reflect and decide if they want to opt into contributing to the culture. If so, they then make clear contracts about their best contribution towards achieving the goals. Encouragers then follow certain guidelines for creating and maintaining a positive environment. They often combine elements that, at first sight, may seem contradictory. They balance encouragement, education, enablement and enforcement. They provide knowledge that enable people to shape their futures. This involves providing tools that are personal, practical and – in the widest sense – profitable. They provide protection and act as custodians of the culture. They protect the environment from those who want to spoil it for others. When acting as custodians, they meet with a person who is causing difficulties for others. 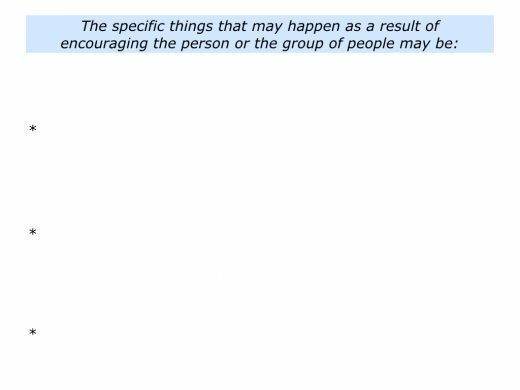 They revisit the original explanation they gave to a person regarding the culture and say something along the following lines. Encouragers love to create a supportive environment. When necessary, they are also prepared to protect the environment for those who want to develop. Good encouragers are like good parents. They are positive and predictable. They create an environment in which motivated people are helped to achieve their picture of success. Let’s return to your own life and work. Looking ahead, can you think of a situation when you may want to encourage a person or a group of people? You may want to do this in your role as a parent, teacher, coach or leader. You may want to do so when facilitating a therapy session, teaching a seminar, doing a project, leading an organisation or doing another activity. 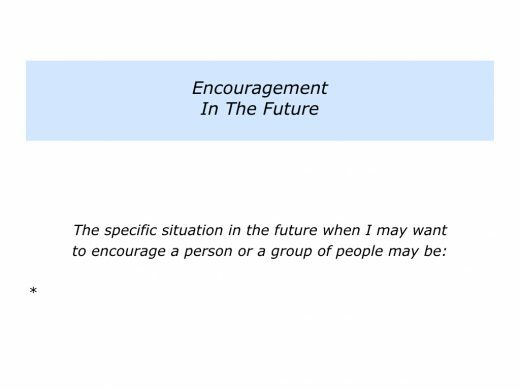 Describe a specific situation in the future when you may want to encourage a person or a group of people. 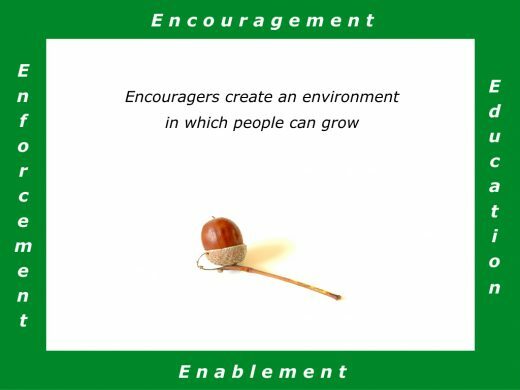 Describe the specific things you can do then to encourage the person or the group of people.